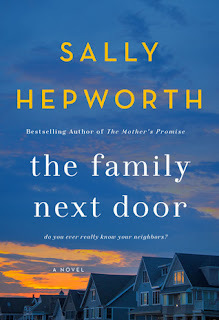 I'm a big fan of Sally Hepworth. Her novels are usually intricately woven stories with several main characters and The Family Next Door was exactly what I was hoping for. It wasn't fast paced and it took a long time to come to a peak but I was hooked from the first few pages. Likely being a mother and a spouse allowed me to place myself in each woman's shoes a little bit more easily. 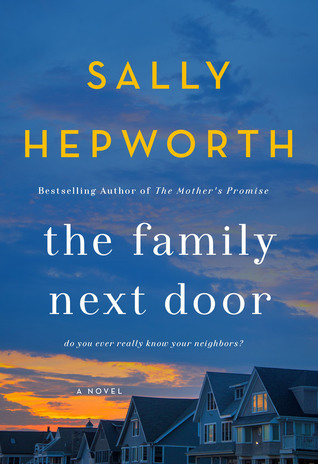 I could relate to each family in one way or another and was intrigued by the concept that you don't really know what's going on behind a neighbour's curtain. Hepworth writes in a way that gives the women the central voice but she also manages to convey the male position as well. Though not the focus she doesn't leave us guessing. Most interesting though was that I didn't see the end coming at all. I was entirely surprised by the twists at the end...shocked even that I hadn't seen it coming. Hepworth writes books that people can relate too and then throws in a curve-ball which will make you think, really think. Enjoyed each character's slant on "married w/ kids". Women certainly have a lot going on, sustaining every day life. A perfect example of Behind Closed Doors. I enjoyed every minute of this read.